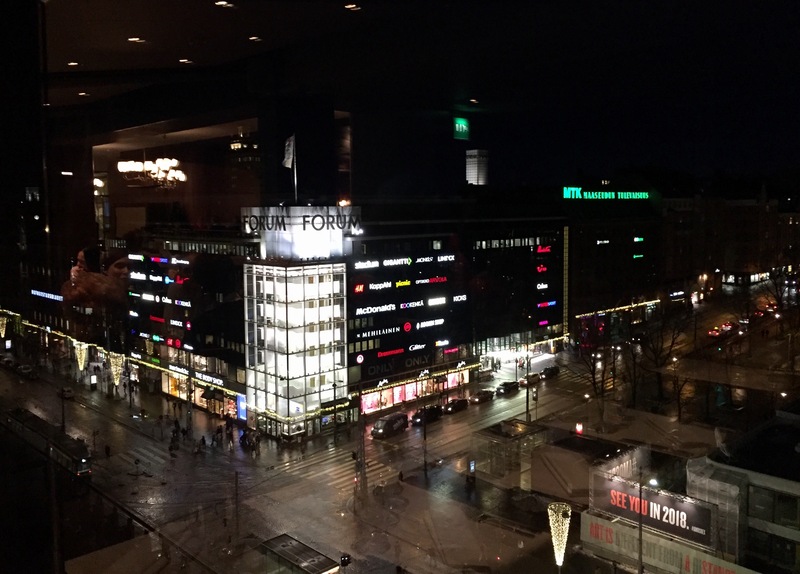 Restaurant Loiste is located in the heart of Helsinki at the 10th Floor of Hotel Vaakuna and Sokos department store. There is a nice view from terraces and part of the restaurant windows. If you are seated on the right side of the restaurant, when you come in, you can not enjoy of the view, unfortunately. 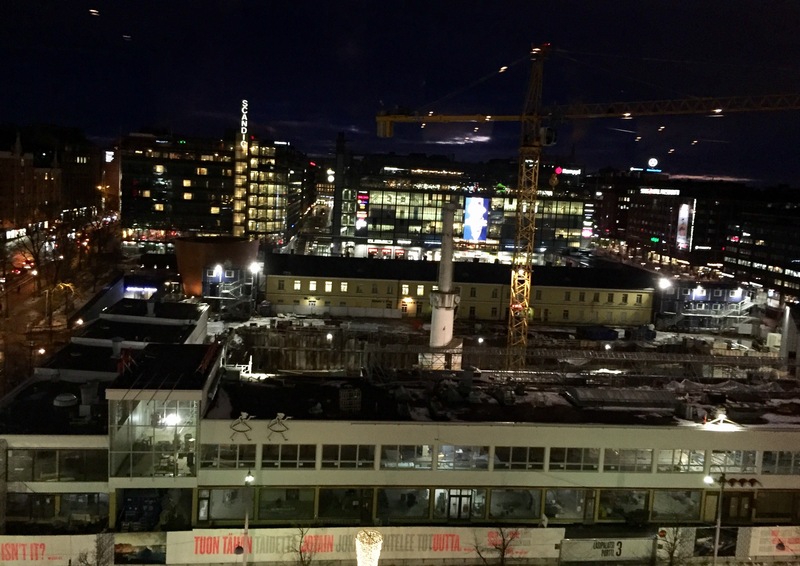 Therefore ask for window table and you can take a look at Kamppi and Forum shopping centres. 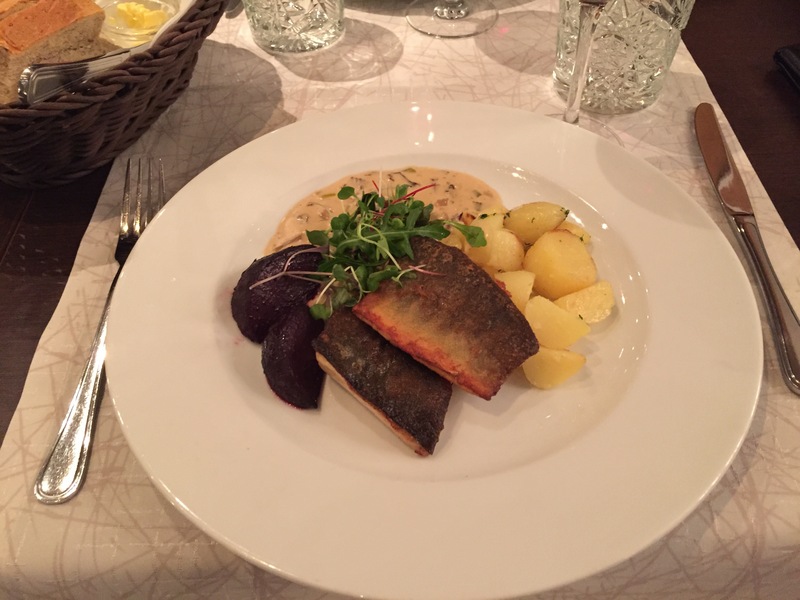 Loiste is casual type of restaurant, but tries to put effort on the menu and food. If you just want to enjoy aperitif or you are not hungry enough, you can visit the bar, which is located at the same premises, at 10th floor. This time no starters as had decided to eat dessert too. However, as portions were not that big, could have eaten Blini, the season dish, for starter. For main courses ordered Fish of the day and Chickpea steak, baked shiitake and kale, bell pepper tzatziki, which was the vegan dish. Fish of the day was Arctic char, which is cold-water fish in the family of salmonidaes. Quite common in Finland. Side dishes were beetroot, potatoes and mushroom sauce. Simple, tasty but fish pieces could have been bigger. For vegan porton, not your typical Chickpea steak. A combination of chickpeas, shredded carrots, and zucchini put together in tasty steak shape. 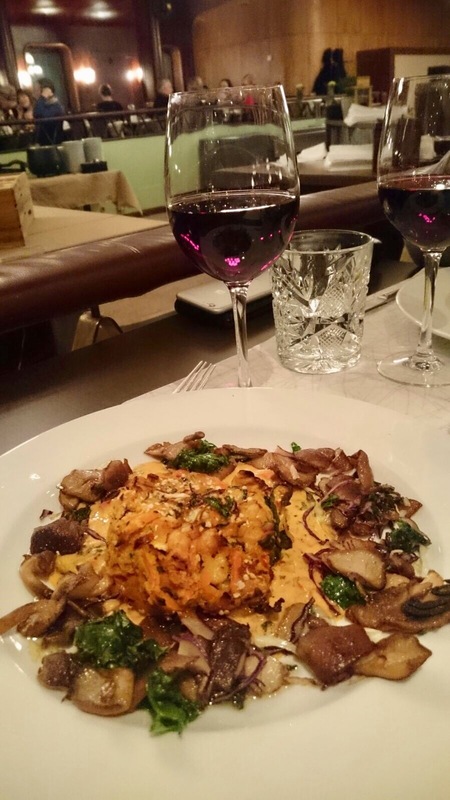 Served with a delicious red pepper tzatziki sauce and a side dish of seasoned wild mushrooms. Overall a delicious dish worth a second try. For desserts ordered English cranberry-chocolate pudding and Basil-Coconat sorbet. 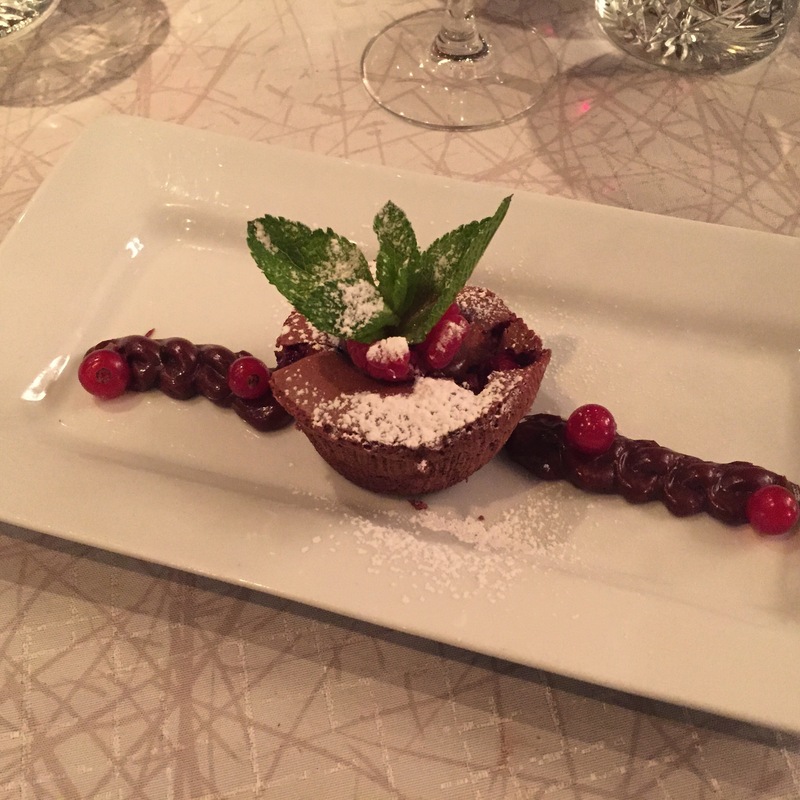 Pudding was more like a cake, but delicious. Again few bites bigger and experience would have been perfect. 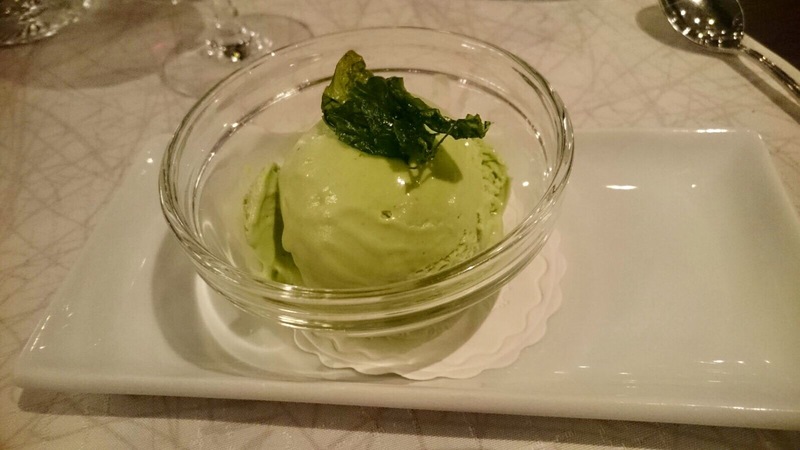 The vegan dessert was a creamy, structure like ice-cream. Basil and coconat are not a common combination, but it totally works! 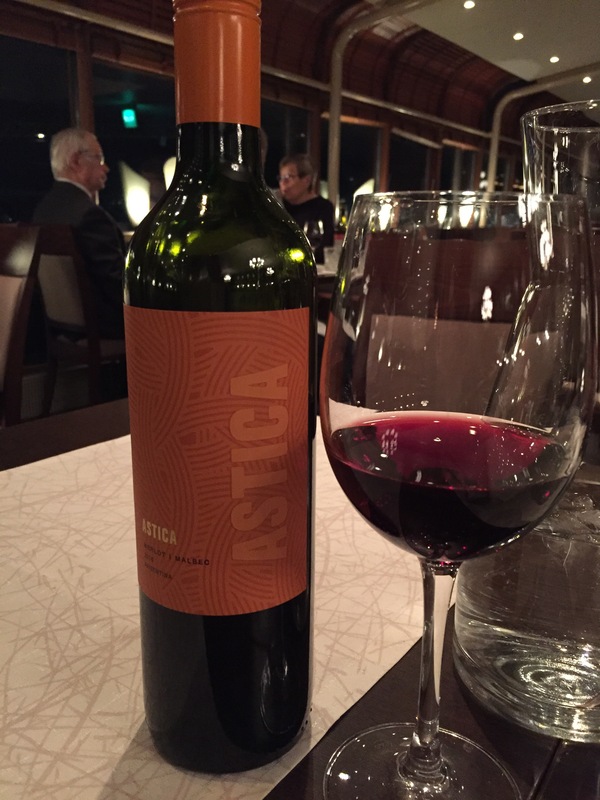 This time had for red wine Trapiche Astica Merlot-Malbec from Argentina. This basic wine had intense red color with ruby hues. Fruits and vanilla aromas, great complexity of the red and black fruits in the palate with sweet tannins. Malbec softened Merlot taste nicely. Bigger portions for the price paid is a wish, when it comes to non vegan dishes. Service was polite but we were wondering why we did not get window table although requested. Few tables were empty all the time by the window. Otherwise restaurant was quite busy. 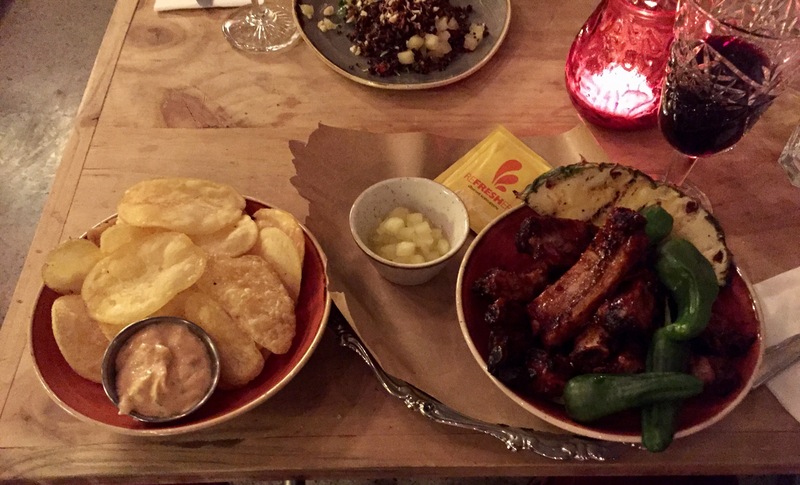 Oficina – Restaurante and Club Social – locates at Kaivopiha plaza in Helsinki, offering Latin food. Inside the restaurant, which is one floor down from street level, you’ll find the dining area, open kitchen and bar. Oficina is owned and operated by S-Group/Raflaamo, which has several restaurant chains in Helsinki area. Oficina menu comes from Latin America, but not from some particular country. The Argentinean asado culture and their charcoal grills are used to prepare steaks, fish and vegetables. From Peru, restaurant has selected the sharp pisco sour, salsa verde from Costa Rica and from Brazil, grilled chicken marinated in coconut. If salsa verde would be from Mexico, the taste of chilli jalopenos would have been stronger. 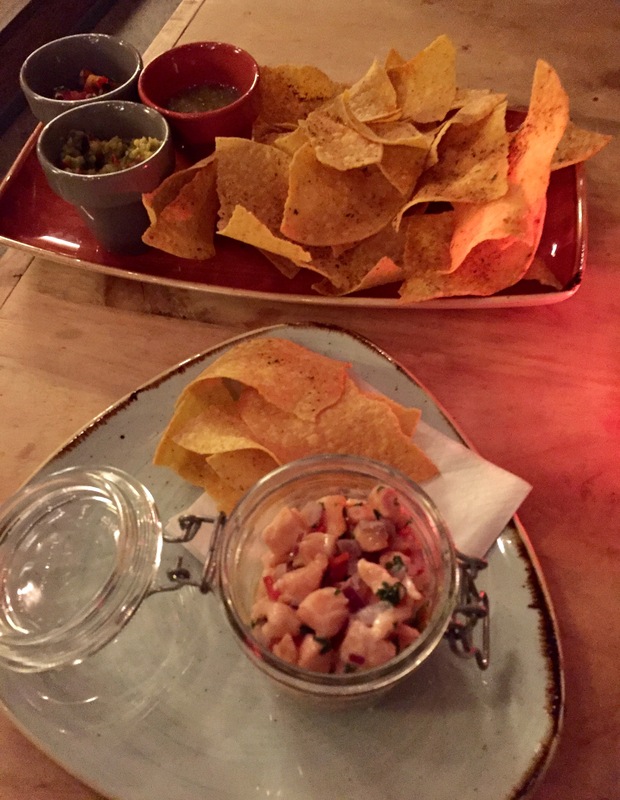 For starters (entradas) chose Ceviche Salmon ceviche, avocado mole salsa and corn chips and Nachos con salsa Oficina’s own corn chips and fresh salsas. Ceviche was fresh and included many pieces of salmon. Typically dominant ingredients are vegetables and herbs but this time there was enough fish. However, lack of lemon or lime and acidity disturbed a little bit, but otherwise salmon paired well with chips. Nachos included 3 salsas and part of them were spiced with red chilli powder. That gave extra taste to so common Latin American starter or snack. The guacamole and pico degallo added were nice, but as mentioned ealier green salsa could have been hotter, not lemony taste dominated. 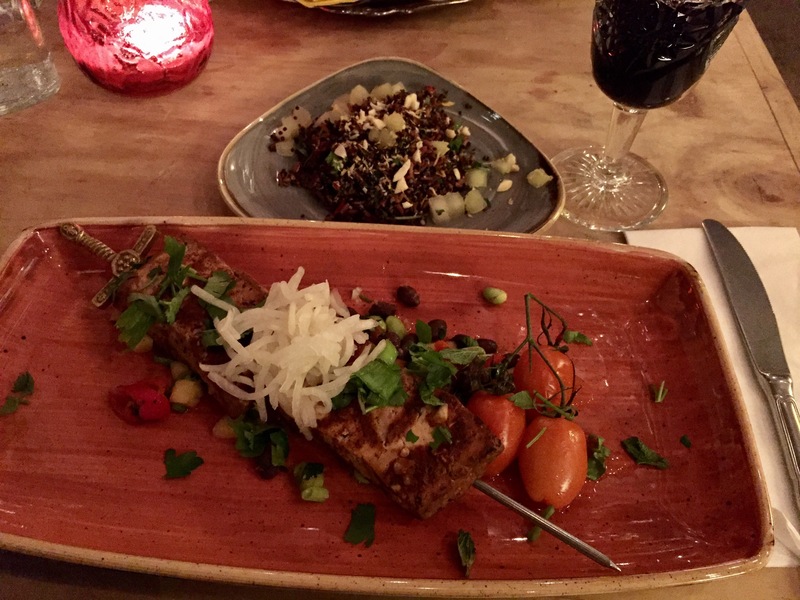 For vegan main course ordered from Latin Grill list Tofu Asado Tofu on a skewer, pineapple salsa, beans and ginger daikon radish and Ribs de Cerdo Pork ribs glazed with chipotle chilli and served with fennel and apple. Ribs had delicous sauce but I think that fennel had been replaced with Pimientos de Padron. At least I could not find it, and apple was also difficult to find. When you order main course from Latin Grill you need also to choose side dishes for them. Ordered Ensalada de quinoa Quinoa, red rice, lemon almonds and apple and Patatas fritas House made chips ja tomato aioli. You might think that patatas fritas are like french fries, but english version tells already something else. First thought that they really were chips, but actually they were little bit thicker and softer. Excellent match with ribs, and would be also good option for starter. Wine list is short but includes enough choises for Latin American food. 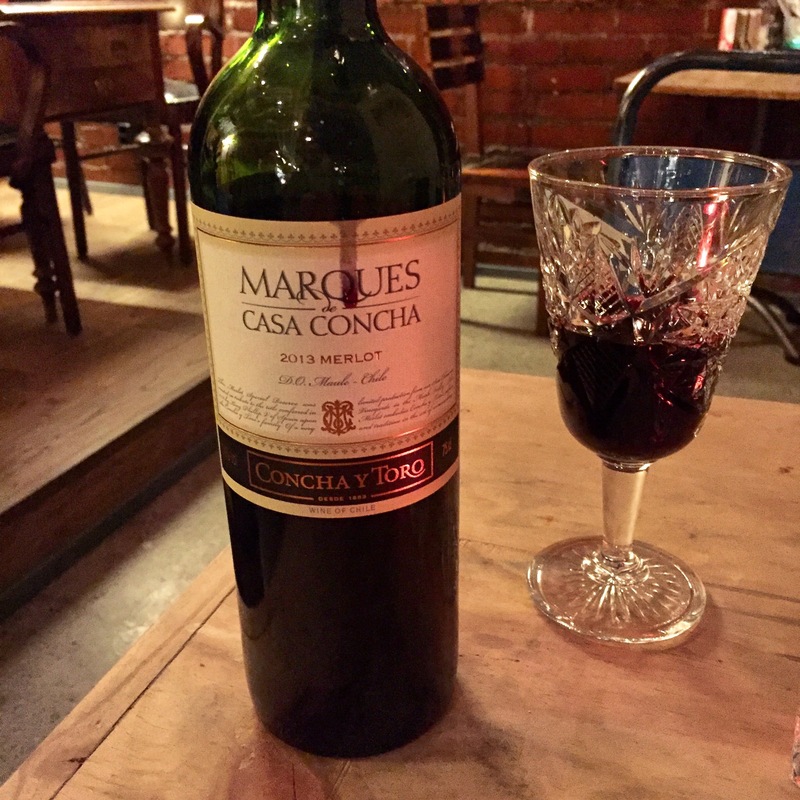 Decided to enjoy bottle of Marques de Casa Concha 2013, made from Merlot grapes. Enough full-bodied and spicy to pair with herbs, salsas and slightly spiced food. 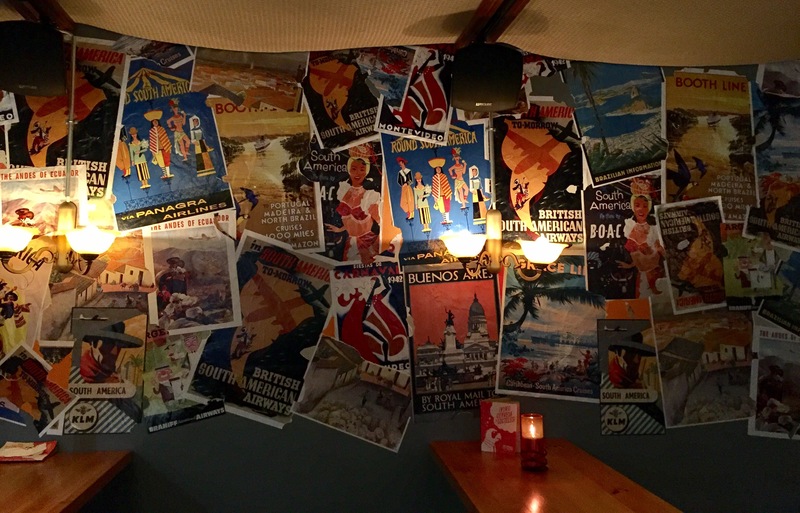 Restaurant has used material for decoration from different South American countries as well as Caribbean Island cultures. 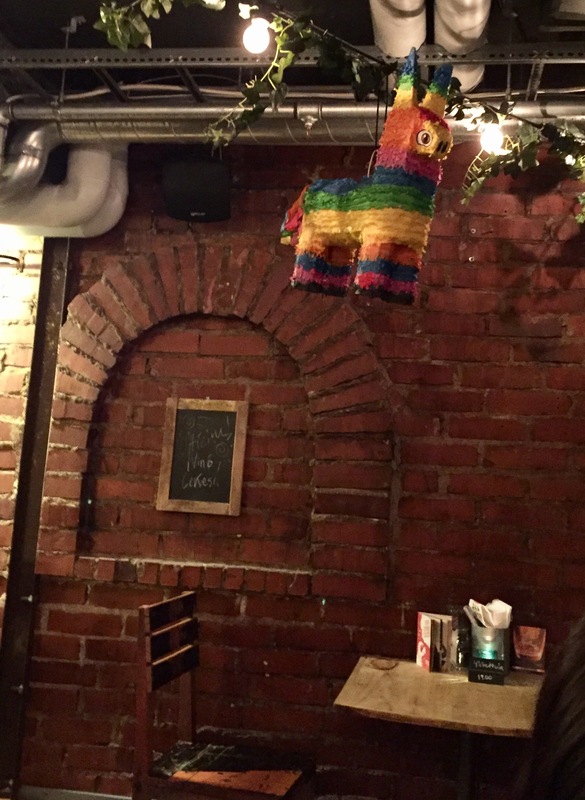 One example is Pinata hanging in the roof presenting Mexican plays. Music comes also from the same direction as food and decoration. Welcomed genre, because you mostly hear same rythms from USA and UK in other restaurants and bars. Food at Oficina is scrumptious and suits for many tastes. A little bit more spicies (read chilli) and herbs, then resataurant would be perfect small Latin America kitchen in Helsinki. Overall grade is 4+ because this restaurant concept has been well designed. Everything around food complements it nicely. Must come back some day later in the evening to check if Club Social continues with same music and athmosphere.